Meet Paul Heiden! Paul’s family has a long history of farming and raising cattle in the west valley of Phoenix. Not only does he share the legacy of his family in this Q&A blog post, but also how his family works hard to be good neighbors to those who have moved in around their feed yard and farm. 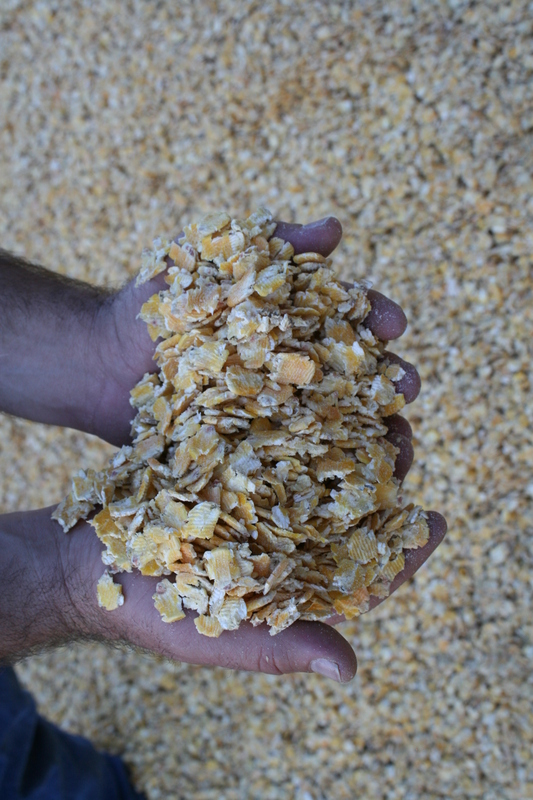 What is the history of your family’s farm and feed yard? Paul: My great-grandfather started farming in the 1940’s which is when he acquired the current farm and feed yard my family still owns and operates. Along with my grandfather, he started with just 320 acres, which is where our headquarters currently is, and a few corrals of cattle. We are fortunate to now farm a lot more land and raise about 5,000 head of cattle per year. Pictured are only a few of the Heiden farm family. Left to right: Richard, Paul, Helen, Dugi, Les, Regina and Cody Raney, and Bruce. What does your family currently farm? Paul: We grow cotton, wheat, alfalfa, and cattle. Who in your family is still involved in the farming and feeding business? Paul: Myself, my brother, my father, my uncles, and my grandfather. When did you start working at the feed yard? Paul: I grew up on the farm and feed yard, so I guess you can say I’ve always been here. I started irrigating fields when I was in 5th grade. In 7th grade, I was promoted to tractor driver and did that through my sophomore year of high school. Then I started driving a feed truck on the feed yard. I attended Arizona State University to further my education and after graduation, I came right back to the feed yard. I’m proud to say I still live on the feed yard along with my grandfather who lives just a few yards from me. What changes have you seen with the town of Buckeye? Paul: When I was growing up, Buckeye’s population was about 5,000 people. Now the population is close to 65,000. Before we didn’t have neighbors anywhere close to us and now we have neighbors half a mile away in one direction and a mile away in the other direction. This has brought both advantages and challenges to our farm. Checking on the cattle every day is an important part of the job. This helps to ensure all the animals are healthy and doing well. What challenges do you face with neighborhoods so close to the farm and feed yard? Paul: We make a great effort to be good neighbors. I can remember being younger and there was a noticeable dust cloud around the feed yard. Now with residences closer to our farm and feed yard, we manage the feed yard and cattle much differently. We want to ensure we are cautious of what is going to affect our neighbors and keep the goal of being good neighbors top of mind. To accomplish this, we water the corrals daily to help keep the dust down with a goal of not allowing dust to leave this property. We clean the corrals yearly, so any smell associated with the feed yard is kept to a minimum. Flies can also prove an issue, so to keep the population small we use a predator fly from a company called Kunafin. This is a natural way to control pests with the use of a fly that feeds on the common house fly. Looking around a feed yard you would expect a lot of pests and flies, but there aren’t any because of these guys. The lack of flies also helps to prevent the spread of illnesses between cattle as flies are great hosts for common cattle-related illnesses. What benefits are there to managing a feed yard close to an urban area? Paul: We have the chance to interact with consumers in this setting much more frequently whereas before we hardly saw anyone not related to or working at the farm or feed yard. I often conduct tours through the Arizona Beef Council which allows people to experience a family-owned feed yard first hand. These folks are always curious about what we do and come with misconceptions I can help clear up by simply taking them around our place and showing off what we do here. Clearing out the manure from the pens allows the Heidens to reuse a waste product by applying it to their farm fields as fertilizer. How do you care for the environment around you? Paul: We are big proponents of reusing and recycling here at our farm and feed yard. We clean all the manure out of the pens on a yearly basis and then apply that manure as fertilizer to our farm fields. What others see as only a waste product, we see as an invaluable resource full of nutrients for the plants we grow. You might say, you only clean the pens once a year?! Let me tell you why that’s a good thing. Because we do live in such an arid climate, we are able to leave the manure in the pens during the year because it dries out quickly. This also helps to form a layer on the top of the dirt which also aids in the control of dust. When it rains, we have a pond which catches all the runoff from the cattle pens. We store this wastewater in the pond and when that gets full it’s used to irrigate our crops, providing more nutrients for the plants. Basically, our goal is to not allow any waste to leave our property. It’s reused in some way. Do you work with any government agencies? Paul: We work closely with the Maricopa Air Quality Control. They come out once a year to check out air quality. We work with this agency to make sure our farm and feed yard are not adversely affecting the air quality around us. Working with agencies like the Maricopa Air Quality Control is an important part of our work. We care about the environment and the land we use, and these folks help verify we are doing a good job reaching that goal. 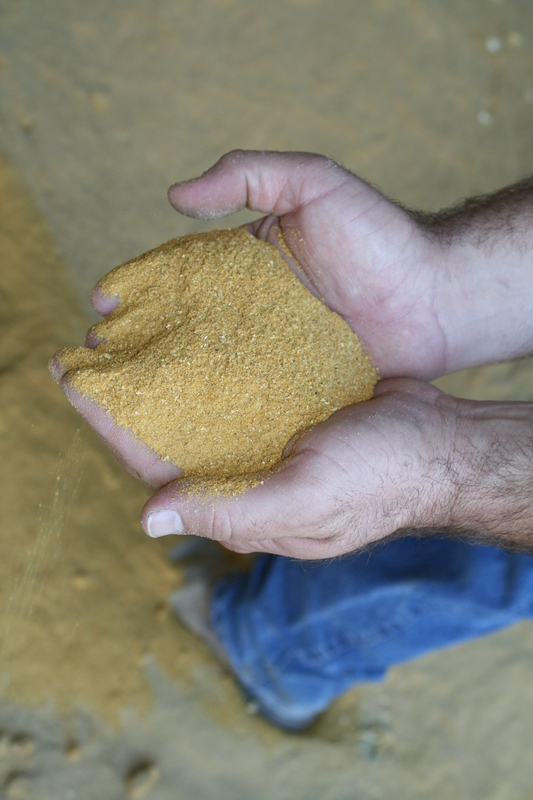 What sort of technologies have you implemented on your feed yard and how have they changed over the years? Paul: We now use radio frequency identification tags, also called RFID tags, which make it easier to track our animals. These work by inserting a small button tag into the ear of the animal, much like an earring, when they arrive at our place if they don’t already have one. This allows us to scan the tag, which automatically brings up all the information we’ve previously logged about that animal while allowing us to add more information, such as vaccinations, illness records, which medications were given, etc. I also use apps on my phone to track weather changes. I check out the temperature, humidity, and if it’s going to rain. This helps us predict if the cattle will start to eat more or less feed depending on the day. Cattle’s appetites greatly depend on the weather. Paul and his family work hard to ensure the best quality care is given to the animals at their feed yard. What do you do to ensure the beef you raise is safe for consumers? Paul: We work closely with a veterinarian who is on call seven days a week. If something happens, which is out of the ordinary, we can call him any time of the day to find out what we should do to ensure the safety and welfare of the animal in question. We also take great strides to prevent illnesses and other issues. Two of our employees walk through the cattle in the pens every single day. They look for any sign of illness, most times being able to identify those signs before the cattle are showing great signs of sickness. Because these cowboys are so good at their job, we can pull them out of the regular pen and transfer the animal to the hospital pen. This is where our veterinarian really becomes integral to our feed yard and the welfare of our animals. We treat the animal with whatever our veterinarian recommends. Whatever product we gave to that animal comes with a strict withdrawal time to ensure all the product is free from the animal’s system before it goes into the harvesting process. At our family feed yard, we actually double the required withdrawal time, airing on the side of caution as each animal metabolizes products differently than the next. If an animal becomes sick and has to be treated within four months of leaving our feed yard, we separate that animal from the usual group, as one additional safety guard against any chance of sending an animal to harvest before their withdrawal time is up. 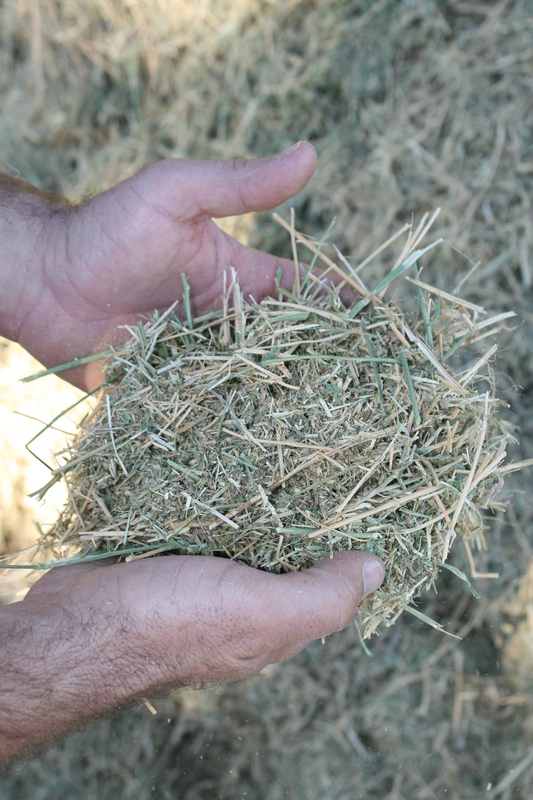 We also have a nutritionist who formulates all our feed rations which are the mixture of feed we feed to our cattle. It’s extremely important to ensure our cattle’s nutrient needs are met throughout their lifecycle as this helps to ensure they stay healthy. 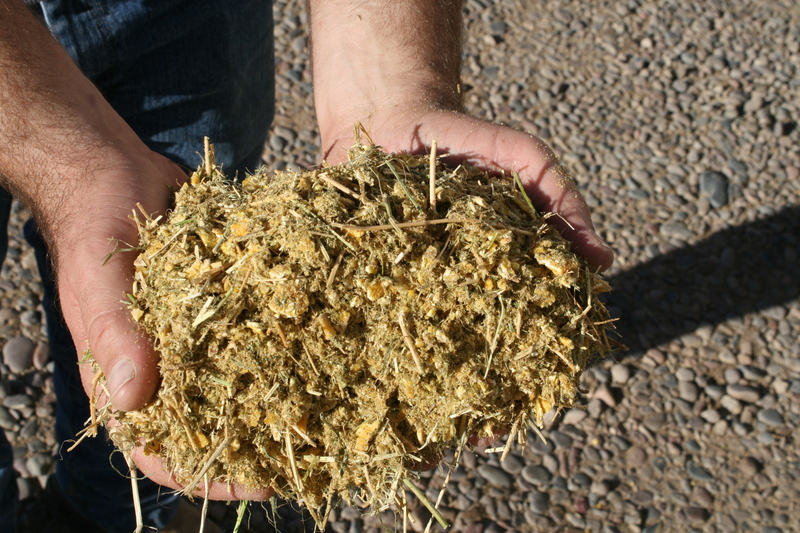 Photo of the finished feed ration which the cattle nutritionist formulates to meet all the nutrient needs of the cattle at the Heiden’s. What is your favorite thing about raising cattle? Paul: I really enjoy going to work each day and spending the majority of the day outside. I also really enjoy knowing I work hard to raise a safe, wholesome, and nutritious beef product for my family to enjoy while other families get to enjoy the same product. Just a quick glance at this photo might leave you questioning in which decade it was taken. This photo was shot in October of 2011. This is the wagon crew in front of the wagon. From left to right are Jared Osbourn, Brother Daniel, Robert Morrison, Jake Rogers, Utah Falcon, Brad Mead, Joel Maloney, and Cody Tillery. What do you think of when ranchers and cowboys are brought up in a conversation? Is it the picturesque image of a mounted horseman silhouetted against the setting sun, surrounded by the blazing oranges, pinks, and purples so characteristic of the Arizona skyline at dusk? Well, hopefully, you’ve read some of our previous blog posts (like this one, or this one, or that one), and have gained a better understanding of what modern ranching really looks like, but this romantic image of the old west is often what comes to mind when ranching in Arizona is brought up. Cow boss Brad Mead catching the afternoon horses at West Split, May 2012. It was done with an overhand Houlihan loop that dropped over the horse’s head. In my line of work (and life), beef and raising cattle is always at the forefront of my thoughts so it comes up often! A large goal of ours here are at the Arizona Beef Council is to share with people the continuous improvement our ranchers are working towards while showing the rich heritage we’ve built on. Many ranches have changed immensely over the past hundred years, while some ranches, due to physical location and terrain, have remained a mirror image of their past. Larry McNab was one of the best wagon cooks the O RO had. He studied at a renowned culinary institute in Germany, but was somewhat of a drifter and was on his way to Las Vegas when his truck broke down and he landed at the ROs. He taught himself how to cook in Dutch ovens and dressed in his vision of what a camp cook should look like, a derby hat and overalls. Years later he turned up on the TV as the winner of the Food Network Competition, Food Network Star. One such ranch is the O RO Ranch just north of Prescott, Arizona. The challenges faced on this ranch and the remote location have made it hard for the average person to visit or even see photos, but Kathy McCraine, Arizona rancher, journalist, and photographer, was granted permission to photograph this living piece of history from 1993-2013. She has since taken her collection of photos and curated them into a beautiful coffee table-style book titled Orejana Outfit, Arizona’s Historic O RO Ranch 1993-2013 for all to enjoy while gaining access to this hidden world. Kathy’s book gives us a glimpse into what the past most likely looked like, and may still, on many Arizona ranches. Her title includes the Spanish word Orejana which refers to an ownerless, unbranded bovine who is old enough to be without its mother. This type of cattle could also be referred to as a “maverick.” The name certainly fits the challenging landscape and remote setting of the O RO which has remained far separate from modern life. This land isn’t suitable for much. Crops won’t grow here, but grasses will, making it an ideal location, now and then, to raise cattle. At the wagon, the remuda ran in grass traps close to camp, and the wrangler gathered them each day. Most of these horses had never seen the insides of a trailer, so the crew trotted them to each new camp as the wagon moved. May, 2007 near West Split. Her collection features countless black and white photos from various places on this 257,000-acre ranch, most taken during fall and spring works. Fall and spring are busy on most ranches, but at the O RO Ranch, this is especially the case. Cowboys with the right set of skills (meaning they must have more with them than just the right outfit and tack) show up to assist the full-time camp men (those that stayed on year-round to ensure the safety and health of the cattle and land) with the task of gathering, branding, weaning, and shipping that season’s calf crop. As you flip through this book and learn about all that goes into these busy times, it’s a tricky task to separate the older photos from the new. The black and white images take away the clues you might use to tell what year each photo was taken and acts almost as if it is a time machine to the past. One might question if this was a photo taken of a 1950’s Hollywood western film star or of an actual hand on the ranch. This is Joel Maloney, jigger boss, Bear Creek Camp, 2012. Along with the numerous photos, a brief description before each chapter gives the viewer more information on what is happening in the photos and why. Detailed histories and understandings are given on the O RO Ranch history and its Spanish land grant roots, the wagon and the crew, the various roles each person plays on the ranch and why, the horses and their importance during these working times, branding, shipping, and much more. Kathy’s book is available for purchase at www.kathymccraine.com. She will also be at the Arizona State Cowbelles’ booth during the Tucson Festival of Books signing copies of this Arizona treasure. Currently, her book is also available at the Phippen Museum of Western Art, Sharlot Hall Museum, Oggs Hogan, and the Old Stage Stop, all in Prescott. Also, at Animal Health Express in Tucson, The Scottsdale Spirit of the West Museum in Scottsdale, and the National Cowboy and Western Heritage Museum in Oklahoma City. Review was written by Tiffany Selchow of the Arizona Beef Council. Raising cattle is a unique experience made up of many hours of hard work and dedication. It’s also a great way to sit back and observe how mother nature can teach you many of the major life lessons you need for a successful life. Enjoy our list of 10 lessons learned on the ranch. 1. Those who say only sunshine brings happiness have never danced in the rain. 2. Water the grass on your side of the fence and then enjoy it. 3. Respect your elders. They have way more life experience than you do. 4. Break the rules sometimes. And then run like heck! 5. Trust the right people. Those who make an effort to show you how much they care are a good place to start. 6. Cultivate and care for your friendships. Your friends are some of the most important people on Earth. 7. Sometimes you have to walk a ways to get where you’re going. But don’t give up because the reward is worth the hard work. 8. Set boundaries with people in your life. And when they cross that line, don’t be afraid to let them know! 9. Don’t be afraid to stand out from the crowd. 10. If you’ve got to pick your nose, make sure no one’s looking. We hope everyone has a great weekend full of laughs, friends and family, and a whole lot of beef! Arizona summers are brutal, to say the least, with reprieve arriving only when you catch sight of dark clouds forming on the horizon, smell a hint of moisture in the air, and the mesquite trees start to rustle as a late afternoon wind tickles their branches. The afternoon monsoon has arrived and if you listen closely, you can almost hear the desert sigh in relief. Monsoon season is a big deal in our state for the average person but proves essential to the cattle rancher. These life-giving rains replenish basin groundwater, recharge riparian areas, give life back to summer grasses, and fill dirt tanks essential for wildlife and cattle alike to survive. Once the rains hit, gone are the days of trucking water to the far reaches of the ranch, as mother nature lifts one small burden off the shoulders of hard-working cattlemen and women. Enjoy this round-up of Arizona monsoon photos from ranches across the countryside in honor of another monsoon season. Photo by Santana Nez of the G Lazy 8 Ranch. Photo was taken in Tucson, AZ.